Silence of the Collegiate Lines consists of spiral bound drawings that decontextualize and repurpose the vocabulary of the lined paper by manually drawing the ruled line with ink. 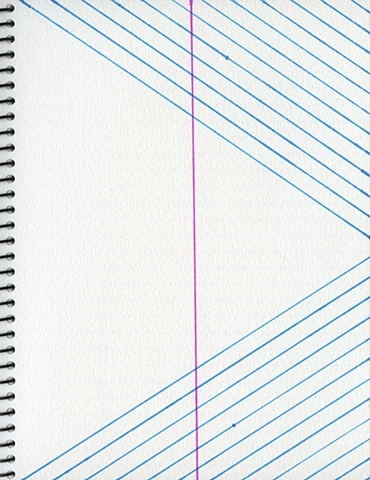 Typically used for handwriting, these drawings play with the familiarity of stationary in an unexpected way. The slow progression from one drawing to the next allows the viewer to begin a poetic journey through a new axis of lined-paper-plains which shift, rotate, multiply and separate, while lines converge, intersect, detour, change color, drip, weave, snap and even break. The minimal and subtle composition turns mundane and functional into quirky and animated space.